Moose, Jonne and Rubiks were the only ones left enclosed, all other reindeer were freeranging. They thought this was extremely unfair, and took the matter in their own hooves. They decided they’d have none of it, and left for an adventure..
After the Christmas holiday, we shut the centre for a couple of weeks and usually let all reindeer out to freerange. This year however, we had a different plan for 3 of our boys. Over the festive season, Moose had been struggling with a quite persistent ulcer on his eye – we had to keep an eye on him and give him eyedrops (up to 7 times daily!). Of course it would be sad to leave him enclosed on his own, as reindeer like to have company. Jonne and Rubiks had already been free ranging for a couple of weeks, and every time they were seen they seemed a little bit thinner than before. This was enough reason for us to put them in with Moose, and keep all 3 of them under our close surveillance. During these weeks of being closed to the public, we get to do tasks we otherwise don’t have time for. 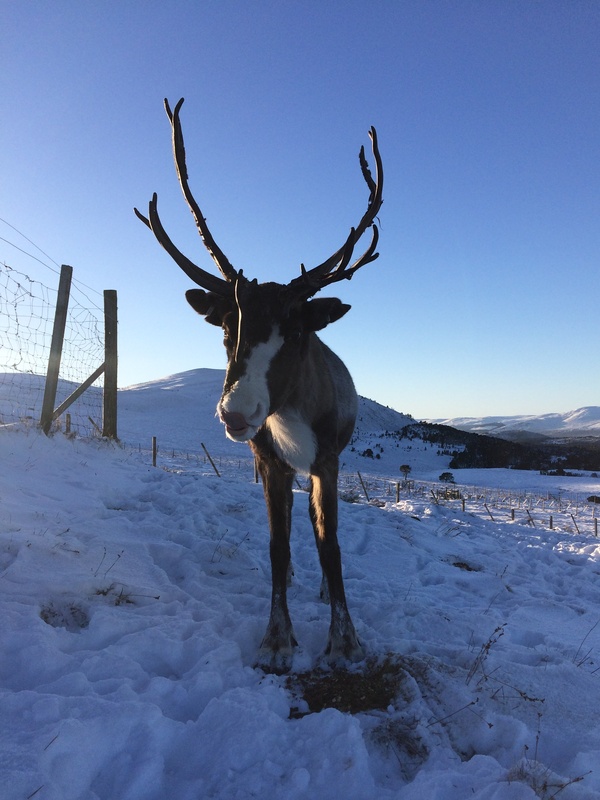 One of these tasks this year was to re-fence the forest area where our paddocks reindeer stay overnight. Moose, Jonne & Rubiks were staying in different parts of the paddocks enclosure during the daytime and nighttime, but little did the herders know that the gate between their night’s stay and the forest area was open! More well-behaved, less naughty reindeer would have stayed put nicely, but not Moose, Jonne and Rubiks.. So the next morning, when we went out to give the boys their breakfast and daily walk, we found them gone, taking themselves out for a walk! 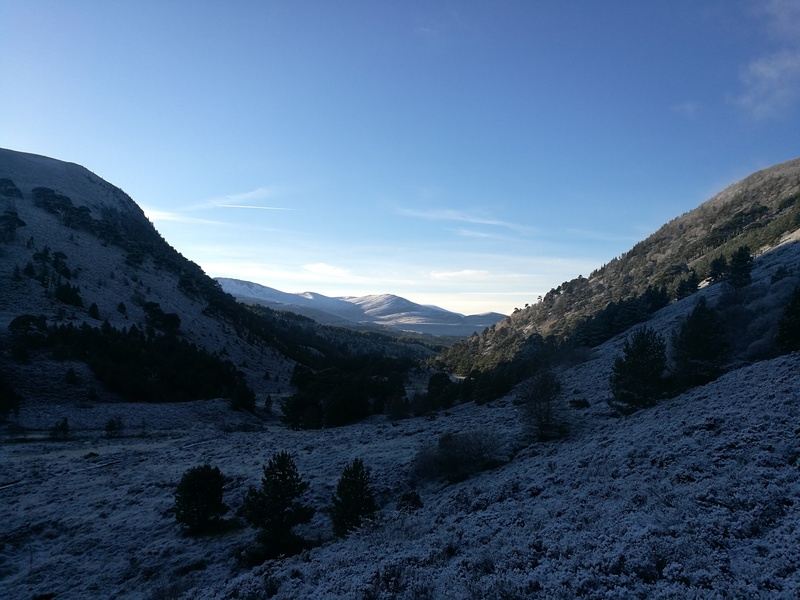 Luckily, for the first time in weeks, it had snowed a little bit overnight, so we were lucky enough to set off on a little treasure hunt, trying to find our escapee reindeer. Quick pause at Lochan Uaine on the way home. 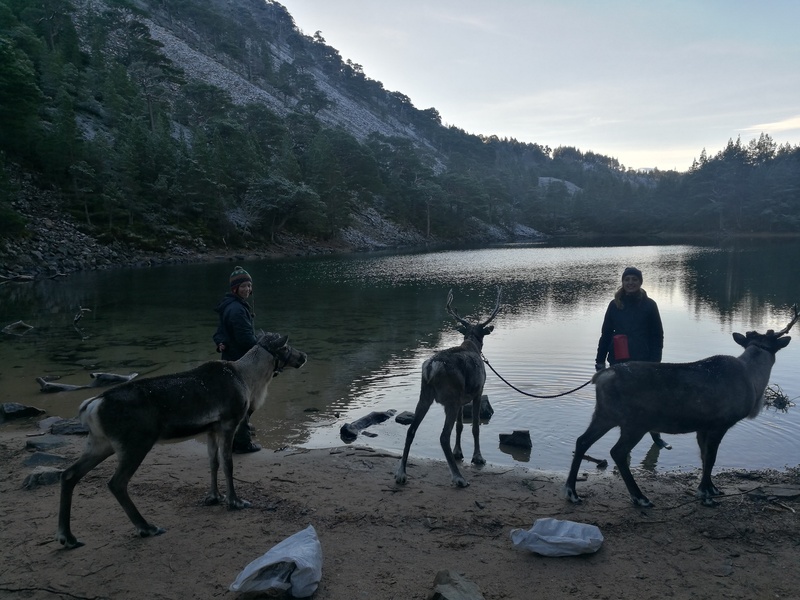 Four herders set off on four different routes – asking any passerby if they had seen any reindeer. They must have thought we’d all gone bonkers. The theory we stuck to is that reindeer like to move uphill, so we did as well. And behind the paddocks is a nice hill we all love to hike/run on, so we figured the reindeer would as well. Five to ten minutes from the top I spotted the first clear hoof prints. Then Andi spotted them on the other side, near the top. Chris also found some, on yet a different route, also near the top. We all followed our own trail of hoofprints, and Andi was the first to find the cheeky boys. Chris and I soon caught up, and all 3 of us led a reindeer on a halter, all the way back to the paddocks. We came across quite a few of the hill walkers we had asked about sightings before, thankfully taking away their concerns about our sanity. It was past midday when we got back to the centre. The boys had had a blast, and to be honest, so had we. We considered “accidentally” leaving the gate open again, but decided against it as it would appear too much of a coincidence (or stupidity) to do so again. We just accepted that we all had a lovely day, and that it was a one-off! 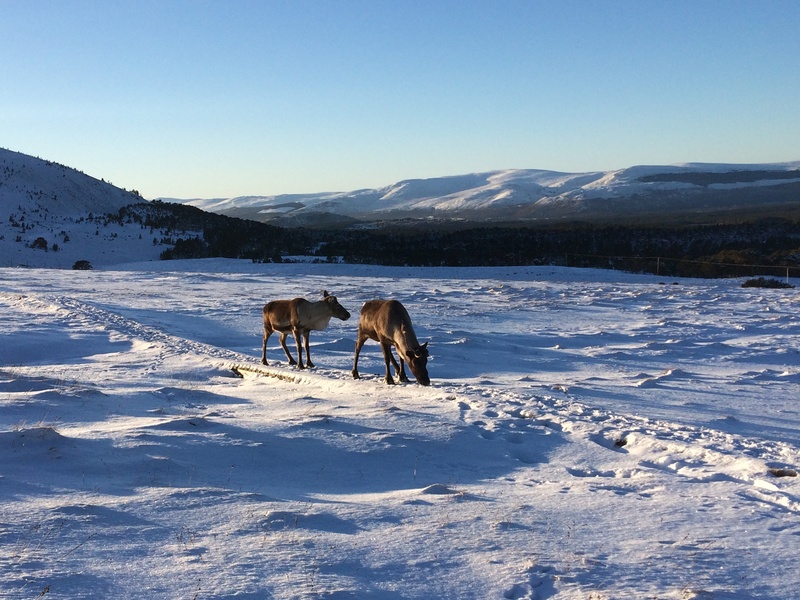 After some more time back in the enclosure recovering Moose, Jonne & Rubiks got what they wanted in the end, and are currently freeranging in the Cromdale hills. After their Great Escape, and Moose only needed a few eyedrops a day rather than 7, we moved them up to the hill enclosure for some extra room and browsing.